Obesity is a global epidemic, preventable, and a disease of clinical and public health significance. It has emerged as a major risk factor for the development of disability, several other noncommunicable diseases, and premature death. This review summarized epidemiological studies related to the obesity prevalence and identified its potential risk factors among the Arab population in the United Arab Emirates (UAE). 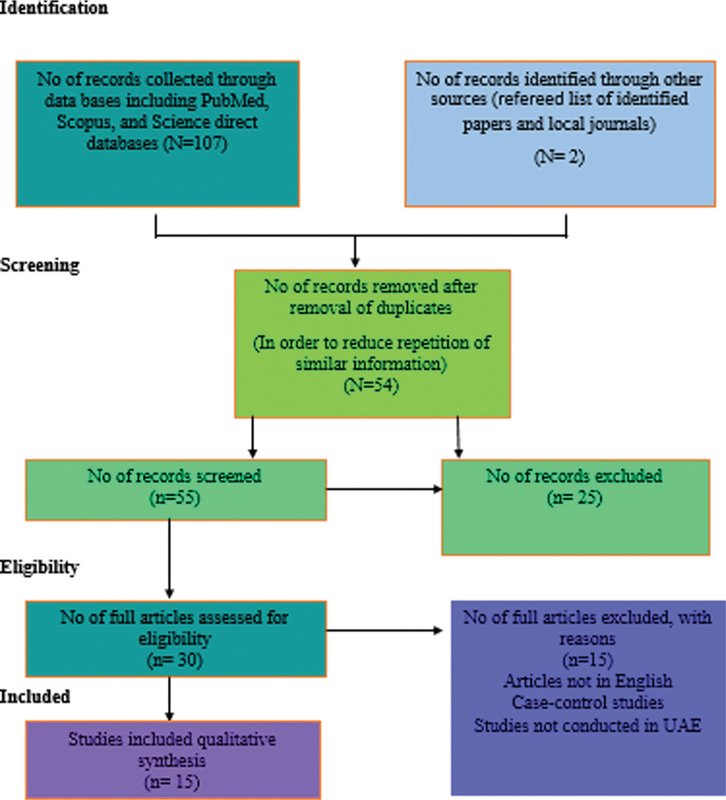 PubMed, Scopus, ScienceDirect database, and other local journals were searched to identify relevant literature by means of appropriate keywords to retrieve studies conducted in the UAE. Search limits were restricted to studies in English language, between 2007 and 2016, and on the UAE population (both citizens and expatriates). The search yielded 15 studies regarding the prevalence and risk factors of obesity, including cross-sectional studies (n = 11), a population-based survey (n = 1), a retrospective cohort study (n = 1), and qualitative focus group surveys (n = 2). Cross-sectional studies found that the prevalence of obesity ranged between 16 and 28.4%, with a higher proportion of adult females being more obese than males in UAE. This increasing obesity prevalence places a large burden on healthcare costs and usage. Furthermore, some potentially essential risk factors were identified, which would help to guide future research strategies. This review signifies a promptly increasing obesity prevalence in the UAE and suggests that extra effort is needed for preventive and curative strategies to reduce the burden of this common condition. Background and Objectives: In Saudi Arabia, overweight and obesity affect more than 75% of the adult population. National studies concluded that the two most contributing factors leading to obesity epidemic in Saudi Arabia are intake of imbalanced diet and lack of regular physical activities. The purpose of this paper is to study the trial of weight loss and the factors that determine it among adult overweight/obese in Abha city, southwest Saudi Arabia. Materials and Methods: This cross sectional study was conducted in Aseer Mall, Abha city during August 2014. To achieve the objectives of this study, the investigators created a questionnaire in Arabic language with the following parts: demographic data, history of any medical condition, awareness about current weight, awareness about harm of obesity, past trials to lose weight, types of interventions to lose weight, and results of trial. The questionnaire was validated by two family physicians and then administered by well-trained nurses to all adult people visiting to “Obesity Exhibition” which was executed by Saudi Arabian society of metabolic and bariatric surgery (SASMBS) in August 2014 for 1 week. Data of the questionnaire were coded, entered and analyzed by SPSS. Results: A total of 422 clients visited the obesity exhibition site during 1 week of the study. Out of them, 263 individuals (62%) were either overweight or obese. The mean age was 36 years; majority of participants were females (71%) and married (67%); housewives and officers constituted 27 and 29% of participants, respectively. About 85% of them knew their current weight, and 92% reported that obesity may give harmful effect on their health. More than 80% of the participants mentioned that they tried to lose their weight in the past, but about quarter (26%) of them reported its success. About one third (37%) of them used both diet and exercise; 3% of them used drugs, while 26% used traditional therapies as an intervention to lose weight. 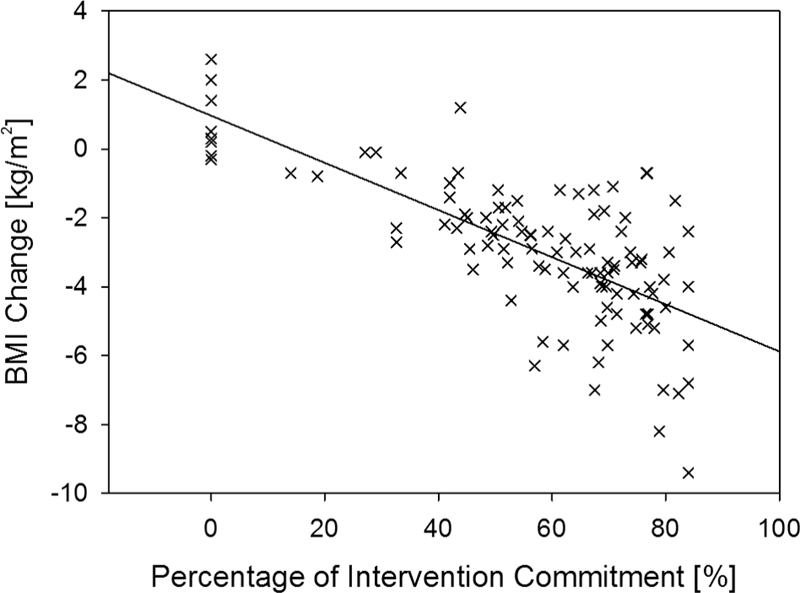 Most of participants (74%) fail to lose weight as they were not adequately compliant with diet and exercise. Average weight loss was 7.5 kg (standard deviation = 6 kg) and a minimum of 1 kg. It was found that females (27%) use herbal products to reduce their weight when compared to males (6%) (P = 0.000). Practicing a physical activity to lose weight was higher among males (31%) compared to females (19%), but no association was found with other demographic variables. Conclusion: Majority of obese patients failed to achieve the target weight loss. The underlying reasons for failure were poor compliance to diet and physical activities. Background and objectives: Overweight as well as obesity is a risk factor of maternal morbidity and mortality in Nigeria. This study assessed the meal pattern and incidence of overweight and obesity among market women in a Southwest community, Nigeria. Materials and Methods: This cross-sectional study involved 250 market women randomly selected by multistage sampling technique. Respondents’ personal characteristics and meal pattern were obtained through a pretested interviewer-administered questionnaire. Their weight and height were measured and used to calculate their body mass index (BMI), which was categorized into underweight (BMI < 18.5 kg/m2), normal weight (BMI = 18.5–24.9 kg/m2), overweight (BMI = 25.0–29.9 kg/m2), and obesity (BMI ≥ 30 kg/m2). Data were analyzed using the Statistical Package for the Social Sciences version 16.0. Results: The mean age of the market women was 37.31 ± 15.31 years and 50 (20.0%) of them had no formal education. Majority of participants ate three meals (64%) while 27% ate more than three meals per day. Breakfast meal was usually skipped by 163 (65.2%) of the women and 155 (62.0%) and 190 (76.0%) women often ate breakfast and lunch meals, respectively, outside the home. The prevalence of underweight, overweight, and obesity was 25.2, 16.0, and 8.0%, respectively. Women’s BMI was significantly associated with their age, marital status, family type, and level of education. Conclusion: This study reveals the high prevalence of overweight and obesity among the market women. Older age, marriage, and monogamous family adversely influenced overweight/obesity. Nutrition education is recommended as an intervention strategy. Background: The treatment of obesity is challenging, and its management is often intensive and requires significant professional commitments. A core principle of behavioral interventions for obesity is self-monitoring, often with a focus on counting calories and monitoring body weight. Objectives: The objectives of this study were to to investigate the effectiveness of weight loss intervention and to assess its effects on wight and some metabolic parameters among obese female attending outpatient clinic at king Fahad Medical city, Riyadh, KSA. 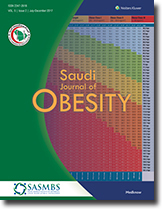 Materials and Methods: Morbidly obese females (n = 104) from an outpatient obesity clinic at King Fahad Medical City, Riyadh, Saudi Arabia took part in the intervention for 3 months and were assessed at baseline and post-treatment. Blood glucose homeostasis and lipid parameters were measured in addition to body characteristics, attitudes toward foods, and intervention commitment. The data were analyzed using the IBM SPSS Statistics for Windows, Version 20.0. Results: A total of 97 morbidly obese females completed the study. Participants achieved moderate body weight (−7.8%) and fat loss (−5.5%); study commitment was strongly associated with body mass index change (rho = −0.703, P < 0.001). Glucose homeostasis improved significantly as follows: hemoglobin A1c level improved by −7.5%, fasting glucose by −7.3%, and Homeostasis Model Assessment insulin sensitivity and insulin resistance improved by about 16%. Blood lipids improved significantly as follows: triglycerides level improved by −14%, low-density lipoproteins by −8%, total cholesterol by −6%, and high-density lipoproteins by +5%. Blood health parameters were significantly associated with distinct commitment to behaviors suggesting improvements in diet. Conclusion: The intervention based on self-monitoring of eating behaviors was effective in achieving moderate weight loss, lead to improvements in blood health-risk markers related to metabolic and cardiovascular disease, and improved food attitudes. Background: Obesity among children is becoming a major health problem in the Kingdom of Saudi Arabia. Little is known regarding parents’ perception about ideal weight among preschool children in Abha city, Saudi Arabia. Objectives: To assess parents’ perception regarding ideal weight for their preschool children and to evaluate their awareness about childhood obesity. 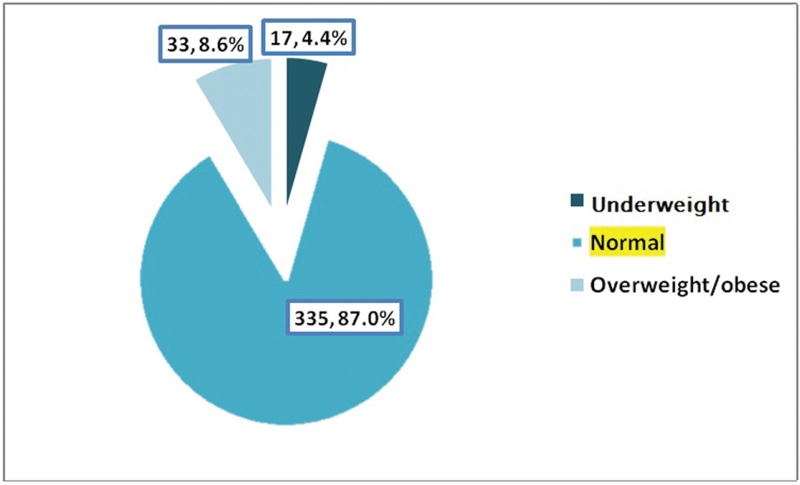 Materials and Methods: This cross-sectional study targeted the parents of healthy children attending primary healthcare centers (PHCCs) in Abha city, Kingdom of Saudi Arabia. The study was conducted in five PHCCs. All parents who had a child aged 12–72 months were included. The parents were interviewed through a structured questionnaire. The questionnaire included 32 questions about demographic data, perception and knowledge about ideal weight, preferred weight for children, and child’s nutrition and lifestyle. Saudi body mass index chart was used to classify the children as ideal, overweight, or failure to thrive. Results: The study included 385 parents and their healthy children aged 12–70 months. The overall percentage of overweight children amounted to 8.6%. It was found that 57.6% of the parents of overweight children perceived the weight of their children to be ideal. On the other hand, 42.2% (141) of the parents of ideal weight children thought that the weight of their children was low, when it was ideal. However, 90.9% of the parents among the children with obesity and 85.5% of the parents among the children with ideal weight preferred their children to have ideal weight. The difference was not statically significant (P = 0.535). Among overweight children, 6.1% of their parents preferred their children to have an increase in their weight. Similarly, among ideal weight children, about 15.1% of the parents preferred an increase in their child’s weight. Conclusion: The majority of parents preferred their children to have ideal weight. There is a need to start a major campaign to educate parents regarding the ideal weight for children and obesity.